How to use the MATC Library's online catalog. Begin by going to the library homepage at book.matc.edu. 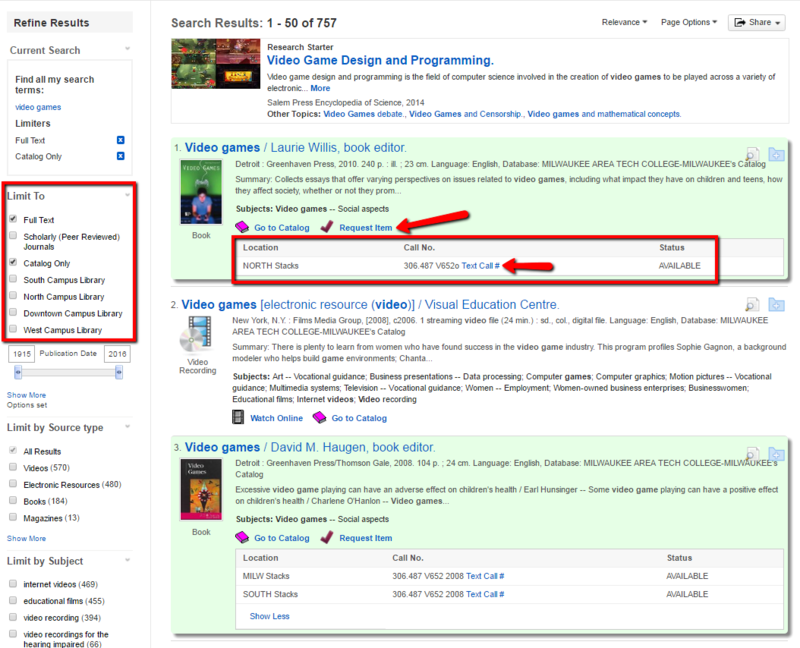 You can search for everything the Library has access to, in One Search, by entering your search terms in the Search Everything box and clicking on Find it! Location: indicates which campus owns that particular book. If the book you want is at another campus, you can easily request it, and choose to pick it up at one of our other MATC campus libraries. Call No: call number indicates where on the shelf the book is located. You can text this call number to your phone now instead of writing it down. Books are arranged by subject, so once you find a book, browse the books next to it on the shelf to find other books on the same subject. Status: indicates if the book is checked out or not. The book record will appear in green if it is available and red if it's not. AVAILABLE - the book is on the shelf and can be checked out. LIB USE ONLY - the book can only be used in the library. DUE - the book is checked out and the due date is shown. You can put a hold on it by requesting it, so you are the next one in line once the book is returned. ON HOLDSHELF - the book was requested and is waiting for pickup on the hold shelf.